I got a great tip from another reader to try a large spread called "the opening of the key". It was developed by the Golden Dawn, an esoteric organisation founded in 1888 and which still today is often called one of the cornerstones of the modern Western Mysticism. The original Golden Dawn branched into different fractions due to internal conflicts, but sprouts of this organisation still exist today. The full spread would take a number of structured steps and understanding Kabbalah and astrology, so I only stuck with the first stage and diverted from there with my own rules. The original spread also uses a significator (a card that is chosen to represent the seeker; the person who is receiving the reading). I'm not personally hugely interested in the origins or specifics of esoteric tarot teachings and I'm only superficially familiar with tarot's history. My own interests lie in the everyday functionality of any tarot deck. 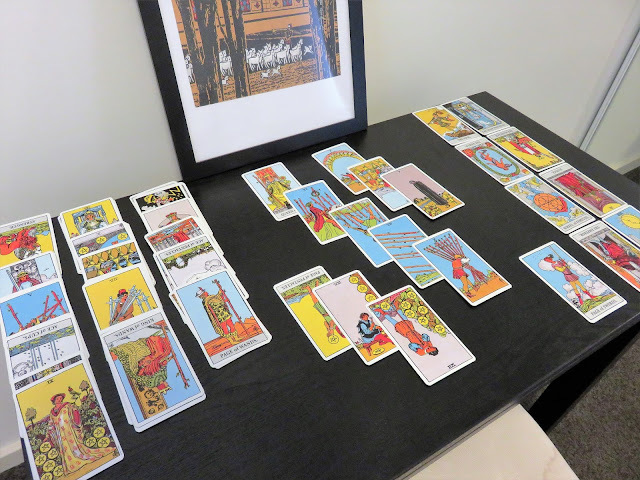 To me tarot cards are art that can be interpreted through knowing the meanings of the symbols and via one's own intuition and deduction skills (what's happening in the picture). My own reading style is a combination of structure and "organic" intuition, i.e. I do rely on the traditional meanings of the cards but I rather "intuit" the message rather than use any rigid reading system. However, this simplified spread, which is similar to the first stage of the Opening of the Key, proved to be a mind-opening experience. Many little nagging issues I haven't been able to accurately pinpoint in my own emotional make-up and psyche were solved in this reading. It uses the whole deck of 78 cards and even this simplified version is fairly complicated for a beginner due to the huge number of cards and lack of positions. If you're already reasonably comfortable with understanding your cards, I strongly recommend trying this. Alternatively, you can try a "beginner's" version, which I explain later, or hopefully find a skilled tarot reader who could do this spread for you. It really can be an ultimate A-HA! trigger. Shuffle the deck and divide it into four equal-sized piles: divide the deck into two halves at first, and then again, into two halves to end up with four piles next to each other. There are rules how to position these piles but I split the first pile into two, put the upper half on the left and the lower half on the right, and then did the same with both halves. Now you have four piles to show your air, fire, cups and earth aspects - with plain English, meaning your mental life, your current motivation or energy, your emotional life and your material life, encompassing everything tangible such as your body, finances, work/career and possessions. Turn over the first pile and fan it out to see what's in there. I organised the cards into groups of four at first, in the order they appeared from left to right. Now look at the whole layout and pick the overall tone. What themes came up? What suits you have the most - Swords (air), Wands (fire), Cups (water) or Pentacles (earth)? How about Major Arcana cards? What life lessons or major themes do the Major Arcana cards show within your mental sphere? Then, read the cards in groups and finally, as a whole. I understood that my deepest happiness (Ace of Cups and the Sun) come from the possibility to be mentally independent, free, creative and resourceful (Ace of Swords, 9 Pentacles, the Empress) and lead the way; i.e. be influential, clear and trusted in intelligence and knowledge (King of Swords). The Major Arcana and the rest of the cards told me that I'm currently learning a lesson that I can always study and learn more, and think and find my own truth, no matter what's the external situation and I should stop worrying (Hermit, Hanged Man, 6 Swords etc.). The lesson is that I should never be staring at and blaming for the externalities, when the power to be happy is inside me - my happiness comes from the thirst for knowledge, wisdom and communication. Lastly, count the cards of each suit to see how they are weighing. I got six Major Arcana, six Swords cards, three Pentacles cards and two cards in Cups and Wands each. This tells that my mental life is very much governed by abstract thoughts, rationalism, analysing, thinking in general, instead of my thoughts being guided by emotions, material concerns etc. Repeat this procedure of interpretation with each pile. For Wands (drive, motivation, inner fire, vitality) I got cards telling that I'm very much motivated by material and pragmatic things right now (King and Queen of Pentacles, 3 Pentacles etc.). I want to make a tangible difference in the world together with others, not just think and talk. For example, starting this tarot blog and business is a great motivator for me, because the more blog visitors or tarot clients I get, the more it indicates my vision, ideas and inspiration are being sought after and valued. This pile of cards also brought up something I've thought a lot lately. Like the majority of people in today's capitalistic world, I used to equate financial success with success in general, whereas I've now realised making money does not necessarily equate mental, emotional or social success. You can feel empty and useless even if you make a lot of money, and reversely, if you don't earn a penny with what you love, it can still give you the strongest sense of purpose, direction and energy. Money can, of course, be one indicator of success, but it most definitely is not the only one and possibly not even the best one. Think wars, drugs, exploiting the nature... they are all money-making machines, but what good they bring to the world? Making money out passion is the ultimate dream, but believing that only money is a measure of success and worth, is simply wrong: that's a pathway to misery, emptiness and purposelessness. For the Cups and Pentacles piles, I found that I'm in a very balanced and happy position in life emotionally and materially - which was clear without the cards, too, but it's always nice to get affirmation! Interestingly and encouragingly, the largest number of life lesson cards (Major Arcana) came up in the Pentacles pile and they showed an ending and a beginning of a cycle in life (the World, the Fool), as well as a lot of passion, creativity, communication, studying and learning coming up (Queen of Wands, 8 Wands, Page of Pentacles, Page of Swords) and an overall flair of a big, exciting change being on its way. I'm curious to see what will show up in my life! What is going on within myself? Air - what is currently in my mind a lot? Wands - what motivates me right now, how does my overall energy level look? Cups - what am I currently feeling, what is topical emotionally for me right now? Pentacles - how is my physical wellbeing; what is the most topical thing in my money/career situation? Interpretation in process, the last pile (Pentacles). I divided the cards into groups of four in the order they were spread out from the fan, but later on I grouped them based on suits and Major Arcana to see the "weight" each suit has in this area of life. My motivation is largely driven by material, tangible matters and vice versa; my material/financial matters are largely driven by what motivates me - I want to work on what inspires me. Hardly a surprise there! A snapshot from my "tarot parlour". 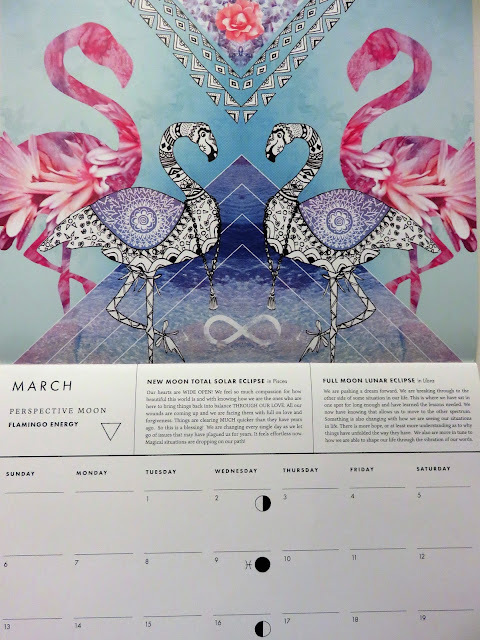 A lovely Tarot Tutoring client gave me this beautiful moon phase calendar as a present - I love it!